Bob Ferrero, Ed Frey, Fred Mann, Bruce Maxwell, Chris Reid, Terl Robinson, Del Tapparo, Gary Wood. 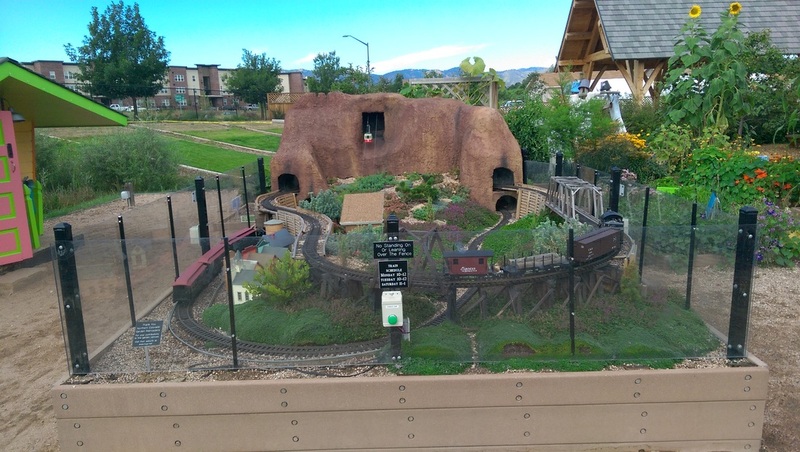 This compact garden railroad (11' X 15') has two trains running on separate loops and a tram that runs up to Horsetooth mountain and back. Kid's control the trains via the two buttons located on each side of the layout (left and right in photo). 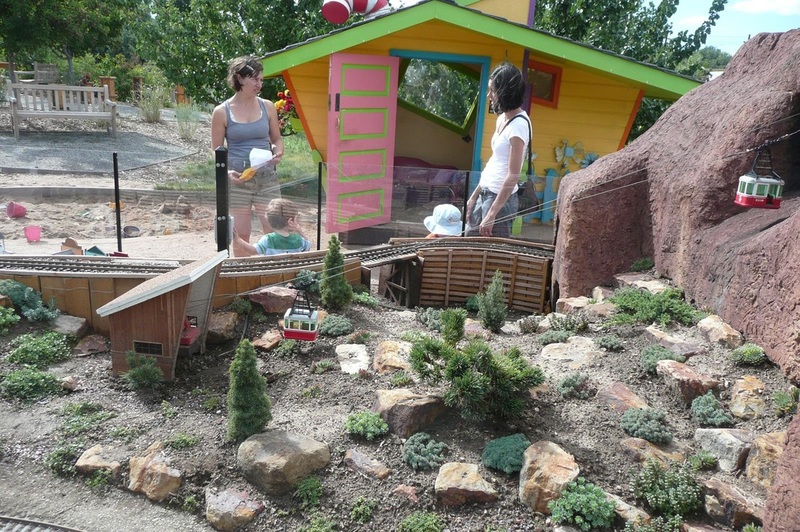 The mountain, made of stucco and wood cabinetry, doubles as a "train shed" when the trains are not active. When a child presses a train button, the train leaves the train shed and starts running the loop making random stops at the town on the lower loop, and the log dump on the upper loop. Trains start again when the child presses the button or it just times out. Pressing the button while the train is running blows the train whistle. If there is no kid activity after a period of time, the trains automatically return to the train shed to get out of the weather, awaiting the arrival of the next visitor. The tram button (center) starts the tram which runs for a period of time and then stops. 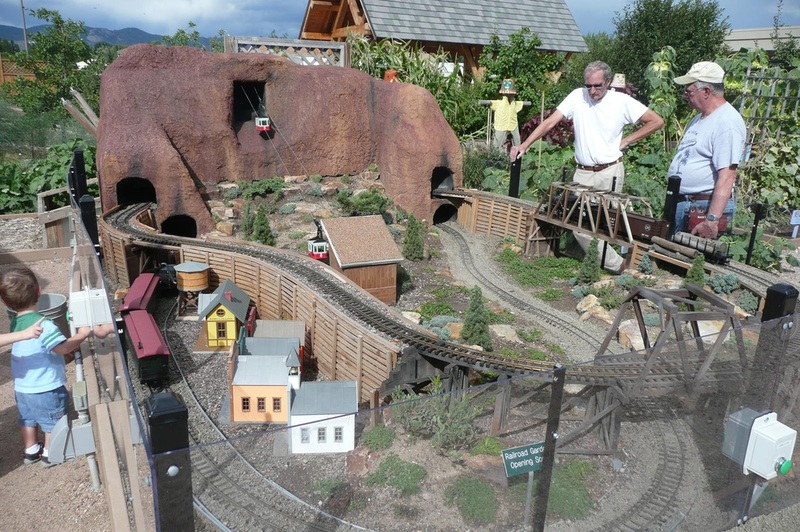 The entire operation is automated using battery power and radio control electronics provided by G-Scale Graphics. While the operation is completely automatic, the plexi-glass fence around the perimeter of the layout doesn't quite keep out all of those curious hands. So Spring Creek volunteers supervise the visitors during operating hours. The Gardens is pleased to have a wheelchair available in its lobby for those who need assistance.